In contrast to the extreme volatility that marked 2018, markets staged a powerful rally to start 2019. Almost all global markets moved sharply higher in the first six weeks of the year. The global stock market rally has been led by the Dow and S&P 500 with year-to-date returns of 7.6 percent and eight percent, respectively. Meanwhile, the PSEi has posted a year-to-date return of 8.1 percent, making it one of the best performing indices in the world and the top stock market in Asia. All four major US indices have posted strong year-to-date returns, as we show in the table below. In addition, US stocks have risen by almost 20 percent since the Christmas eve plunge. 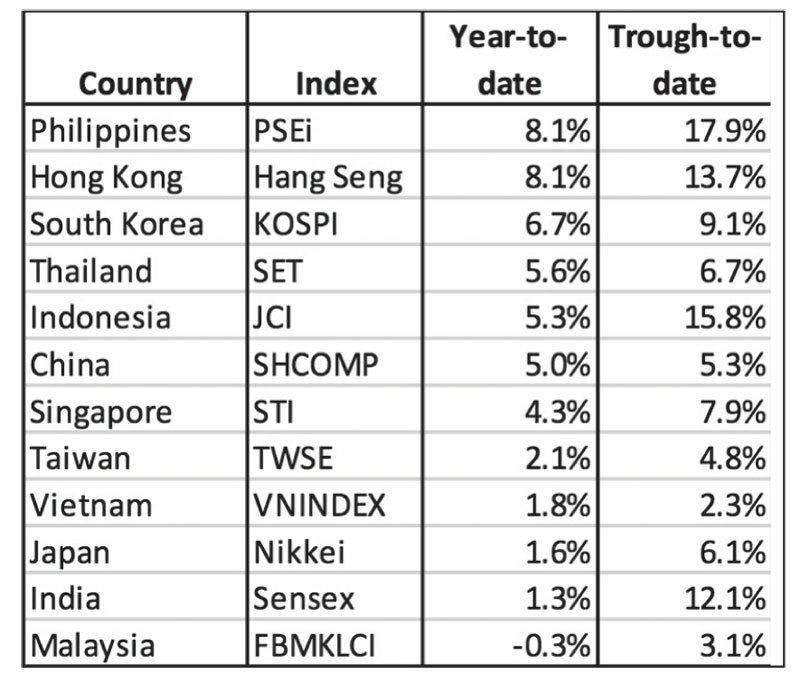 Meanwhile, the PSEi is the best performing market in Asia in terms of year-to-date returns. The PSEi has also bounced 17.9 percent from its trough in November last year. Below, we briefly explain the reasons which drove the recovery in global stock markets. 1. The Fed turns dovish. After spooking the markets with hawkish rhetoric, Fed chair Jerome Powell assured that the Fed would be ‘patient and flexible’ with monetary policy. Powell’s statement sparked a global rally in stocks and a strong rebound from the market rout in December. 2. Temporary peak for US dollar and bond yields. Powell’s dovish statement has caused a temporary respite in US dollar strength and a sharp pullback in US bond yields. These moves have driven a rally in emerging market countries including the Philippines. 3. Cautious optimism on trade. US Treasury Secretary Steven Mnuchin said that a recent round of talks with China’s Vice Premier Liu He would be followed by another round of negotiations in Beijing. Meanwhile, Trump’s conciliatory tone towards China came as a positive surprise and bolstered optimism on the trade talks. China’s economic stimulus. China has cut its reserve requirements and has signaled more stimulus measures to support its slowing economy which has been hampered by the trade war. We enumerate below the catalysts which have made the PSEi the top stock market in Asia year-to-date. 1. Inflation has peaked. January inflation slowed to 4.4 percent from 5.1 percent in December and a recent peak of 6.7 percent in September and October. 2. Rebound of the peso. After touching a 12-year low of 54.40, the peso strengthened 4.3 percent against the US dollar and closed at 52.07 last Friday. 3. Foreign flows have turned positive. 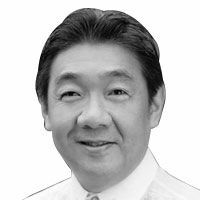 Year-to-date net foreign buying has amounted to P22.5 billion, a reversal from last year’s net foreign selling of P57 billion and P105 billion (ex blocks). After a turbulent 2018 and a rout in December, markets have staged a strong rally in the first six weeks of 2019. The strong year-to-date move of the market reinforces our call that we have seen the low for this correction. Nonetheless, markets may continue to be volatile and tricky given ongoing trade talks between the US and China. With many sticking points that have yet to be resolved, the two countries have a long way to go before they finalize a comprehensive trade deal. Meanwhile, there are still concerns about the global growth outlook due to the slowdown of many major economies led by China. The deep dive of the markets last year and the subsequent sharp recovery this year underscores the importance of adopting a long-term view on the stock market. It is typical for investors to be unnerved by periods of extreme market volatility such as the one we experienced last year. However, long-term investors who follow an asset allocation strategy and risk management plan are better positioned to withstand short-term market gyrations. In the long run, macroeconomic performance and corporate fundamentals will ultimately determine where the stock market goes.